Quite a bit of choice. We see several countries with multiple marches. 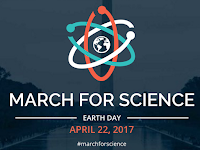 The Netherlands shows the Amsterdam march, but ideas have been posed to organize a Science March in Maastricht too. Well, I will be marching. For what? For the importance of apolitical, nonreligious facts about the world. Facts that can be proven true, but also for a world where people value facts, fulfilling the human rights for everyone, as facts don't care about race, gender, color, left, right, or nerdiness. Our world is precious; human and nature is precious. If we choose to destroy the world or if we choose to prosper mankind and nature, let it because of neutral facts. Not wishful thinking, money, or politics. Let's show that science (of any domain, not just life sciences, but also humanities, etc) is by everyone and for everyone. Access to knowledge is a human right, is to benefit everyone. 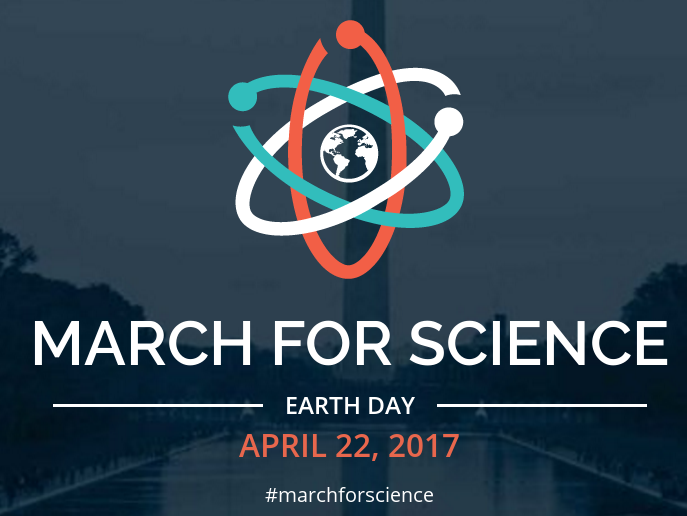 The march is for everyone too: you do not have to be working in scientific research to join the march to express your wish to have a fact-based country. April 22, Amsterdam and Maastricht! Join! Already many months ago I joined a bio.tools (doi:10.1093/nar/gkv1116) workshop in Amsterdam, organized by Gert Vriend et al (see this coverage). I learned then how to register services, search, and that underneath JSON is used in the API to exchange information about the services. One neat feature is that bio.tools allows you to specify a lot of detail of the service calls. Now, at the time we had already used OpenAPI (then still called Swagger) for Open PHACTS for some time, which we later picked up for other projects, like eNanoMapper (API), WikiPathways (API), and BridgeDb (API). OpenAPI configuration files also describe how web services work. So, the idea arose to that it should be possible to convert the first to the second. Simple. I started a GitHub repository, but, of course, did not really have time to implement it. Then, half a year ago, at the ELIXIR track meeting at the ECCB in The Hague (where I presented this BridgeDb poster), I spoke with people from ELIXIR-DK who were just starting a studentship scheme. This led to a project idea, then a proposal, and then an small, approved project, allowing me to fund Jonathan Mélius to work on this part-time, for about a man month of work, spread over several months. 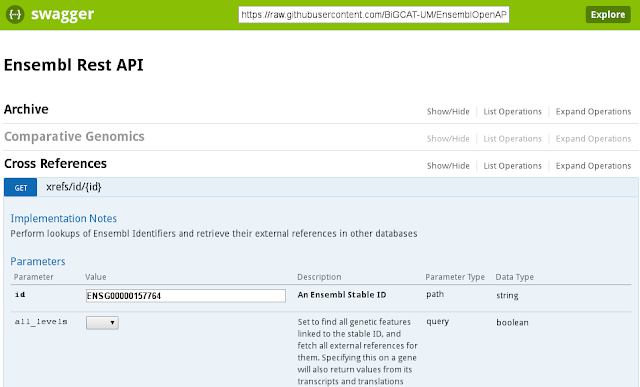 The observant eye will see that various bits of details of the descriptions of the API calls are annotated with EDAM ontology (doi:10.1093/bioinformatics/btt113) terms, a key feature of bio.tools. 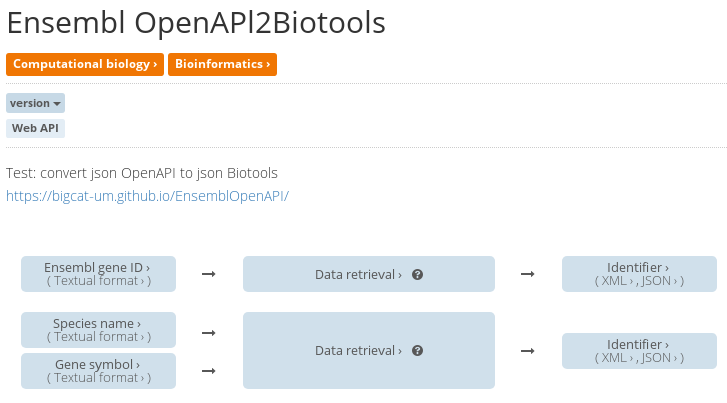 This information is currently not available in the OpenAPI JSON (we will be exploring how that specification could/should be extended to do this). Moreover, the webservice API methods need ontological annotation in the first place, and we will not be able to totally remove human involvement there. The EDAM IRIs are still hard-coded in the conversion tool at this moment, but are being factored out into a secondary JSON file for now. So, the conversion tool will take two input JSON files, OpenAPI + EDAM annotation, and create bio.tools JSON output. The latter can then be inserted into the JSON. We will work on something based on the bio.tools API to automate that step too. So, we still have some work to do, but I'm happy with the current progress. We're well on track to complete this project before summer and actually get a long way with the ontology annotation, which was an secondary in the original plan. eNanoMapper has ended. It was my first EC-funded project as PI. It was great to run a three year Open Science project at this scale. I loved the collaboration with the other partners, and like to thank Lucian and Markus for their weekly coordination of the project! Lucian also reflected on the project in this blog post. He describes the successful completion of the project, and we partly thank that to the uptake of ideas, solutions, and approaches by the NanoSafety Cluster (NSC) community. Many thanks to all NSC projects, including for example NANoREG who were very early adopters! 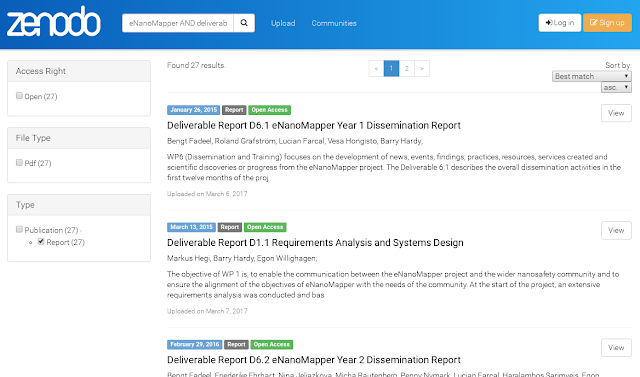 Next time, I want to see if we can get the deliverables published in, for example, Research Intentions and Outcomes journal. 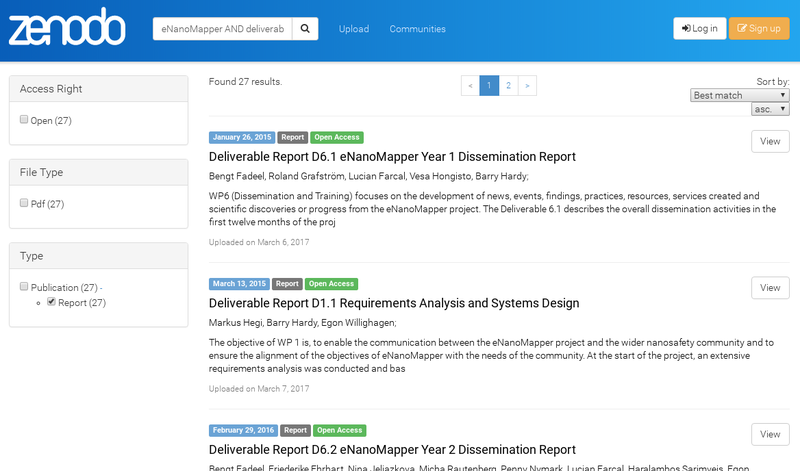 Finally, I like to thanks everyone else if the Maastricht University team that worked on eNanoMapper: Cristian Munteanu, who was my first post-doc, Bart Smeets, Linda Rieswijk, Freddie Ehrhart, and part-time Nuno Nunes and Lars Eijssen. Without them I could not have completed our deliverables. Upcoming meeting: "Open science and the chemistry lab of the future"
At the Open science and the chemistry lab of the future meeting meeting I will represent ELIXIR, which is quite a challenge as they are doing so much, and I only have so much time to cover that. Worse, I am only part-time working on specific ELIXIR tasks, but fortunately getting great help from Rob Hooft of the Dutch Techcenter for Life Sciences (DTL, practically the Dutch ELIXIR node). 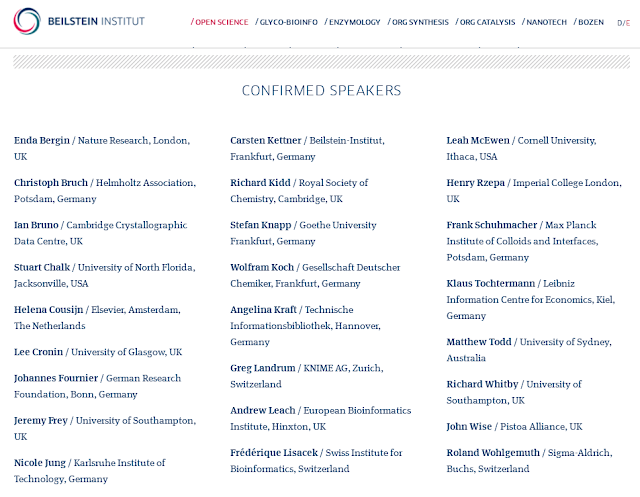 I am very much looking forward to meeting friends and seeing people I have only yet met online, like Stuart Chalk (who recently published the CCZero Open Spectral Database) and Open Source Malaria Matthew Todd. 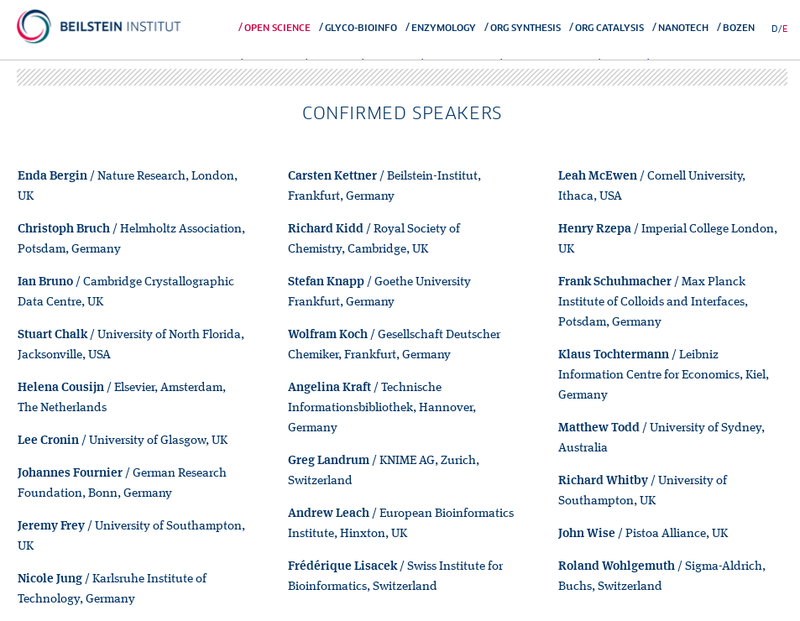 Oh, and if you cannot attend the meeting in person, the hashtag to follow is #BeilsteinOS. If you can join, you can register to the meeting here.